Red-skinned onion blooms from March to May and has an oniony odor. Its whitish pink flowers appear in clusters at the ends of foot-long or more stems. 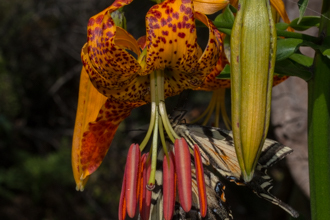 A general characteristic of plants in the lily family is their growing from bulbs, rhizomes or corms. Red-skinned onion's flat and narrow leaves and stems emerge from clusters of 1 inch oblong bulbs with reddish-purple outer layers. 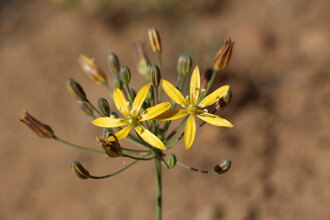 The flower clusters form at the ends of 1/2 inch stems, from 10-30 flowers compacted at their heads. 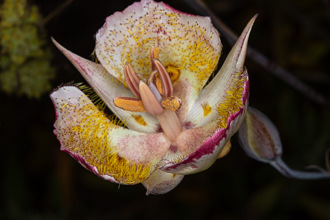 Each flower has 3 petals, 3 sepals which look like petals, 6 stamens and 1 pistil. 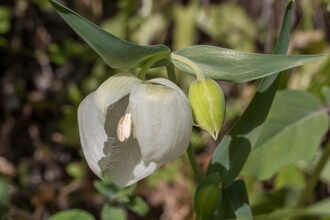 The flowers are white to pink in color. The genus name Allium is Latin for "garlic". 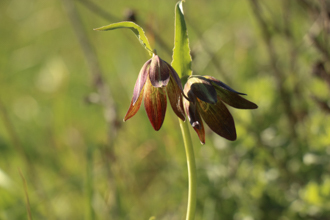 The species name haematochiton translates as "blood coat", referring to the red skin of the bulb. Last modified: May 12 2017 16:41:11.